This webinar was originally scheduled for July 11, 2012. The date has been changed to September 5, 2012. NACTO’s Urban Bikeway Design Guide has quickly emerged as the preeminent resource for designing safe, protected bikeways in cities across the United States. 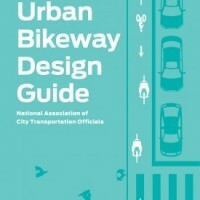 NACTO will release the second edition of the guide in the fall, with updated graphic profiles for all of its bicycle facilities, a new subsection on bicycle boulevard planning and design, and a survey of materials used for green color in bikeways. The guide continues to build upon the fast-changing state of the practice at the local level; it responds to and accelerates innovative street design and practice around the nation. Join APBP and NACTO for a free, 90-minute webinar on the second edition of the Bikeway Design Guide. This training offers a unique opportunity to learn directly from some of the cities that compiled the guide. Attend this webinar to gain a better understanding of the guide’s contents, hear how to use and implement these designs, and find out what NACTO envisions as the next steps to adopt and deploy these tools and design guidelines.